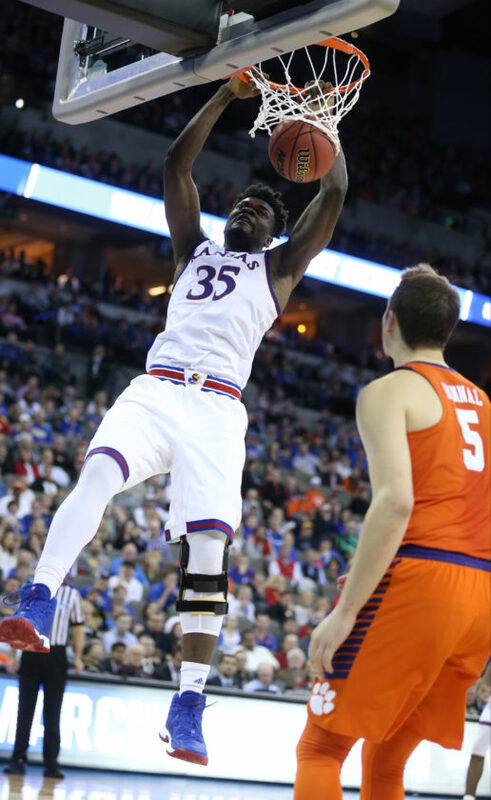 Kansas center Udoka Azubuike (35) delivers a jam before Clemson forward Mark Donnal (5) during the first half, Friday, March 23, 2018 at CenturyLink Center in Omaha, Neb. 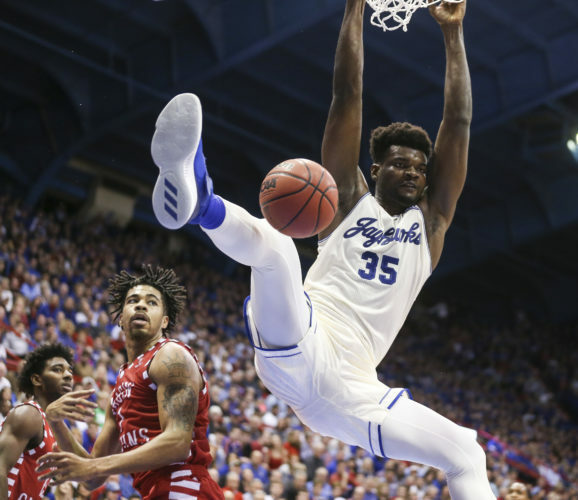 For the third time in the history of the Associated Press Top 25 men’s college basketball poll, Kansas will enter a season ranked in the top spot. 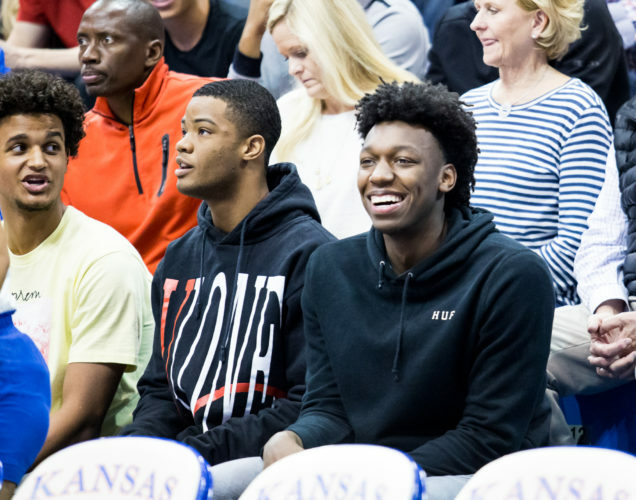 KU received 37 of a possible 65 first-place votes in the first AP poll of the 2018-19 season released on Monday, edging out Kentucky for the top spot. 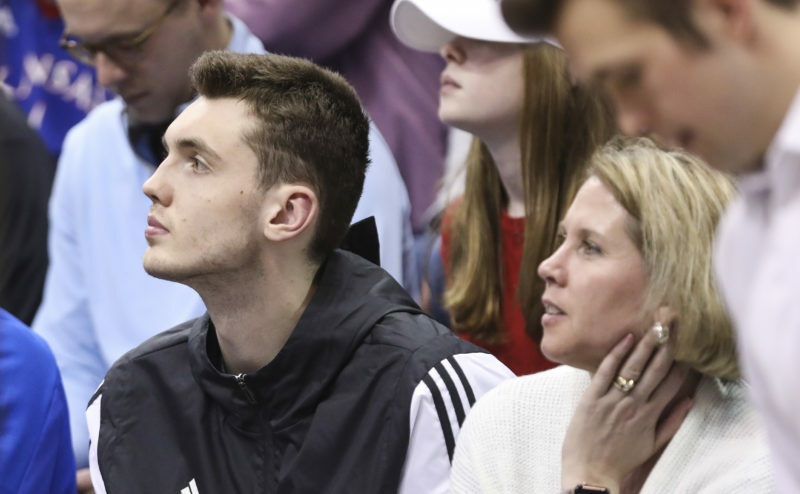 While Kansas received 57 percent of the available first-place votes, Kentucky picked up 19 first-place votes and was one of seven teams to receive at least one first-place vote in the fast-approaching season’s initial poll. Included on that list was defending NCAA champion Villanova, which, at No. 9, received one first-place vote. 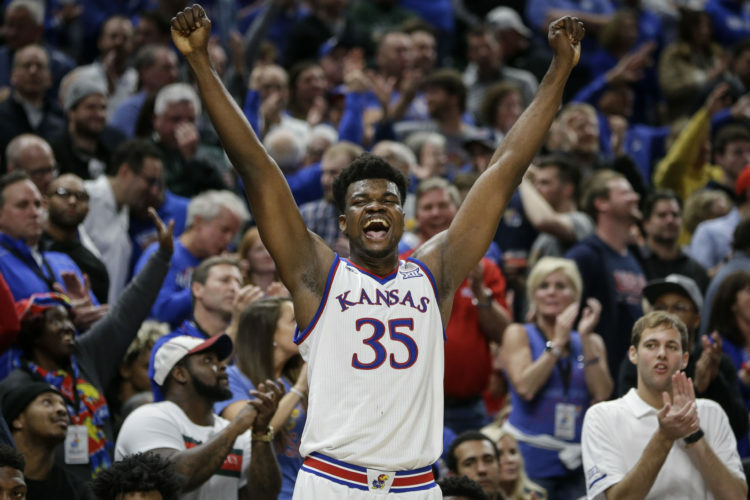 Villanova will play at Kansas on Dec. 15 in the first game of a home-and-home series between the Jayhawks and Wildcats slated for the next two seasons. No. 3 Gonzaga (1), No. 4 Duke (4), No. 5 Virginia (2) and No. 6 Tennessee (1) joined KU and Kentucky in receiving first-place votes. In all, including a potential matchup with Tennessee in New York City in November, the AP Top 25 features seven programs on KU’s 2018-19 schedule, four of which are ranked in the Top 10, including No. 10 Michigan State, which Kansas will face in the season opener Nov. 6 at the Champions Classic in Indianapolis. The number grows to 11 when you look at the number of 2018-19 KU foes either ranked in the Top 25 or receiving votes in the AP’s first poll of the season. 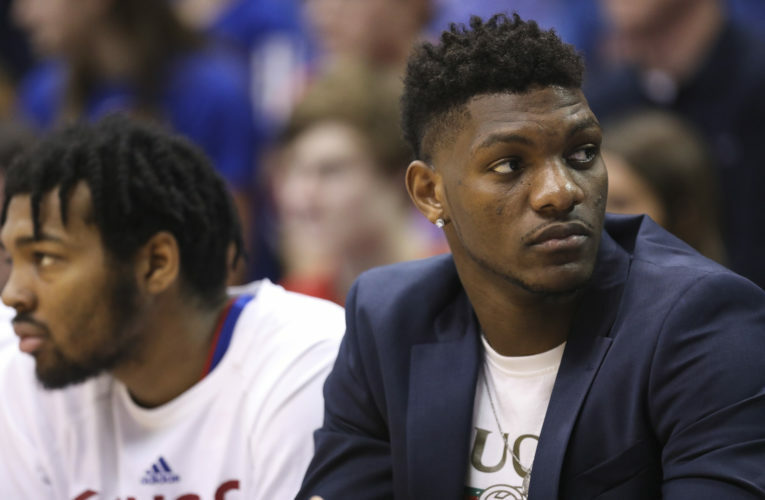 KU’s three appearances in the top spot of the preseason AP poll all have come under Self. But unlike the 2004-05 squad, which featured four seniors and four juniors, or the 2009-10 team, which was led by senior Sherron Collins and seven players considered to be upperclassmen, KU’s 2018-19 team features just one senior — guard Lagerald Vick — and a trio of juniors who have combined for just 47 starts at Kansas. KU’s streak of a spot in the AP poll for 180 consecutive weeks — dating back to Feb. 3, 2009 — is the longest active streak at the NCAA Division I level. This marks the 13th time in Self’s 16 years at KU that the Jayhawks have entered a season ranked seventh or higher and the sixth consecutive year that KU has been ranked in the AP Top 5 to open the season. Kansas entered the AP poll at No. 4 last season and held the same ranking in the final AP poll of the 2017-18 season, which was released prior to the start of the 2018 NCAA Tournament. The Jayhawks also have been ranked No. 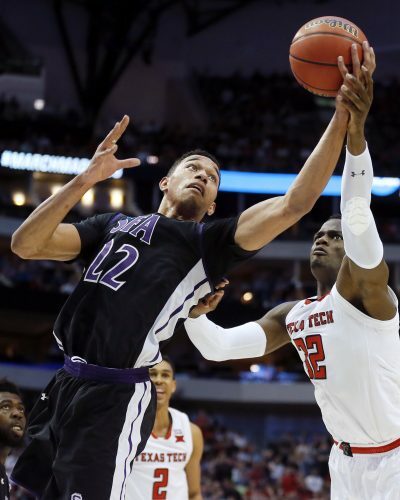 8 or higher in 49 consecutive AP polls during the past three seasons. Kansas tips off its 2018-19 schedule at 7 p.m. Thursday with the first of two exhibition games. KU will play Emporia State on Thursday and Washburn on Nov. 1 before traveling to Indianapolis. Others receiving votes: Loyola of Chicago 162, Marquette 124, Indiana 98, Florida 71, Nebraska 35, Maryland 28, Wisconsin 24, Notre Dame 22, Cincinnati 21, UCF 15, Alabama 15, Arizona 14, Buffalo 14, Louisville 11, Miami 10, San Diego St. 9, Texas Tech 6, Southern Cal 6, Butler 6, Texas 5, St. John’s 3, Arizona St 3, Providence 2, Xavier 2, Davidson 1, Missouri 1, Marshall 1, NC State 1.